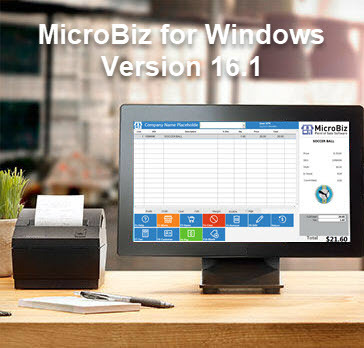 Newly released MicroBiz for Windows version 16.1 includes several updates to integrated payments. 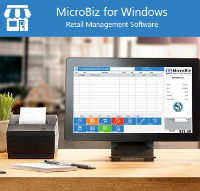 We wanted to make you aware of new features that may improve your experience with our MicroBiz for Windows software. Global Payments is in the process of ‘end of lifing’ the X-Charge payment gateway, which has been integrated with MicroBiz for Windows for 15+ years and replacing it with a new payment from its OpenEdge subsidiary. Given this situation, we decided to switch to the OpenEdge Gateway in order to make sure that our customers enjoy the advantages using the best supported payments technologies from Global Payments. Starting with the upcoming MicroBiz version 16.1 update, MicroBiz for Windows will only support the OpenEdge Gateway for integrated payments. If you currently or expect to use integrated payments with MicroBiz, in order to upgrade your MicroBiz system to version 16.1 (or any future version) you must uninstall your X-Charge gateway software and install the OpenEdge gateway software. 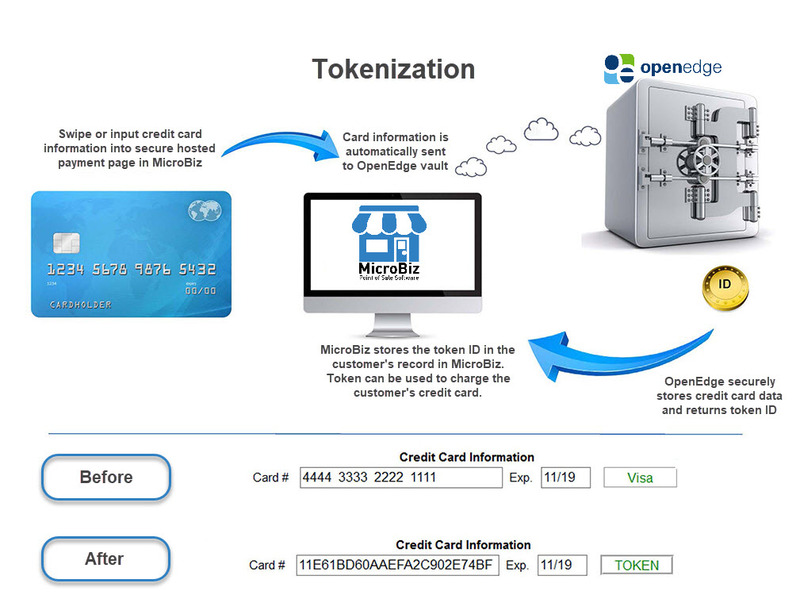 This process will need to be coordinated with OpenEdge, and in some cases may involve updating your merchant agreement with OpenEdge/Global. The good news is that the OpenEdge Gateway provides a more stable, fast and streamlined processing experience. 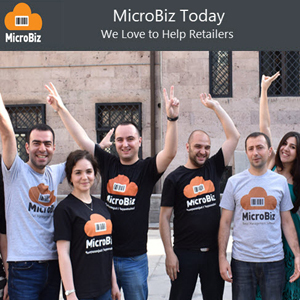 The gateway also allows MicroBiz to support additional features not previously offered (see below) – as well as new features planned in the future. If you do not have X-Charge installed on your system for integrated processing, you will not need to do anything special in order to upgrade to version 16.1. This requirement only applies to current users of X-Charge. As mentioned above, it may take some time to update your merchant agreement with Global/OpenEdge and plan for the migration to the new OpenEdge payment gateway software. If you have any questions about this process or whether you will need to modify your merchant agreement, please first call our MicroBiz Support or Sales teams before calling OpenEdge. We are more familiar with these specific requirements than a standard support rep at OpenEdge. OpenEdge has made many improvements that have resulted in more streamlined payment processing versus X-Charge. Faster Processing and Authorization Times – Processing transactions with OpenEdge required fewer ‘calls’ between your POS system and terminal and Global Payments. The result is faster processing speeds and shorter authorization times than are available through the X-Charge gateway. 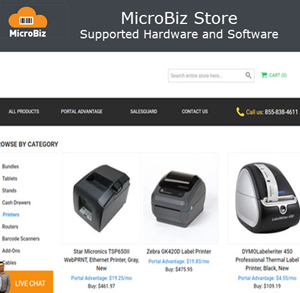 Improved Installation and Updates Process – All the technology for card processing and devise set-up now resides within your MicroBiz system. This allows for faster and easier updates and patches. You will no longer dread receiving messages from Global that its payment gateway software needs to be updated. Better Performance – The ‘footprint’ or memory taken by OpenEdge is very small. This leaves more memory available for other programs – resulting in better computer performance. Newest Technology – The OpenEdge Gateway features the latest technology and security and is the technology platform that Global Payments will use for future integrated payment features and innovations. This will allow you to enjoy future services and improvements as they become available. The security experts at OpenEdge have achieved QIR certification and can ensure that you are using payment applications installed and serviced in accordance with PCI standards. You can now safely and securely store the credit cards of your customers, allowing you to bill them without requiring the credit card to be present. With the OpenEdge Token Vault, your customer’s credit cards are stored safely and securely remotely in OpenEdges remote servers. This card information can be accessed through your MicroBiz system using a payment token that does not contain any sensitive card information. This approach complies with PCI and other security regulations. Payment information can be saved quickly and easily by swiping the card or entering it into a hosted web form. 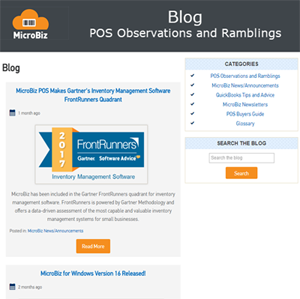 The token from the Token Vault can be used to pay for transactions right from the F9 tender screen in MicroBiz. This is great for for use with credit account customers and remote billing. This allows your customers to make purchases without the need to enter and re-enter their credit or debit card information each time they make a purchase. Keeping cards on file make subscription-type recurring payments quick and easy. 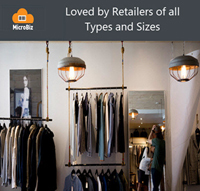 There is no additional charge for use of the Token Vault with MicroBiz for Windows. If you process any sort of repeat or recurring transactions, you’re more than familiar with the headaches of declined cards. When a scheduled transaction doesn’t occur due to expired or outdated card information, it means lost and delayed revenues, staff time dedicated to tracking down customers, and greater fees. The good news is that these are completely preventable problems if you use the Decline Minimizer payment card auto update service from OpenEdge. 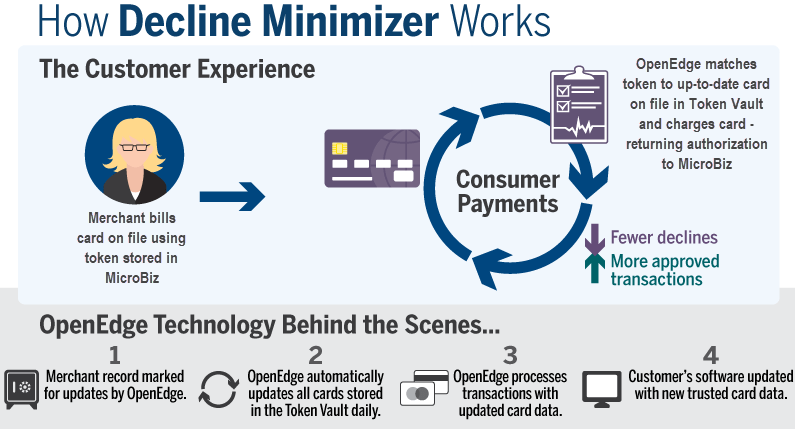 OpenEdge’s Decline Minimizer automatically updates expired and outdated Visa and MasterCard card information daily. The updating process is automatic – Decline Minimizer works behind the scenes to receive card updates from the card brands. You do not need to take any action in order to maintain the most up-to-date card data. This service is free to OpenEdge users. 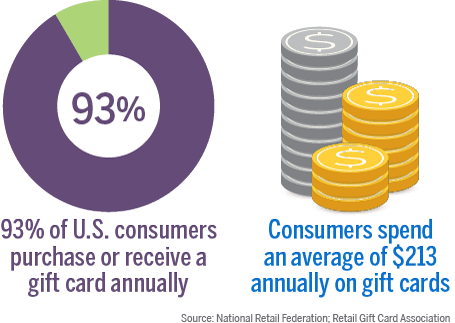 Gift cards have been demonstrated as an effective and cost-effective way to drive new customers and get the regular customer back to return. Gift cards can ramp up sales and expose your business to new potential customers. They can be used as a powerful reward incentive for special promotions or to maintain customer loyalty. The OpenEdge Gift platform offers card-based loyalty programs with secure, real-time transaction processing. Premium, branded card production is included, as well as in-store displays and merchandising and features full reporting. If you use gift cards with X-Charge, you will continue to use them with OpenEdge.